Meanwhile, over at the ‘Pick Me Up’ event currently rocking Somerset House, in one of the high ceilinged, wood-panelled rooms off the vaulted gallery, Landfill Editions have installed their new / old gadget, a Risograph machine, a piece of almost obsolete office equipment that’s been repurposed to make nearly instant art, writes Liz Farrelly. 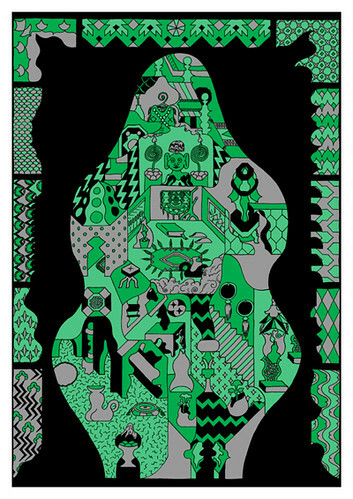 Above: Colin Henderson’s green and black print from Fundraiser Print Series no. 1. Landfill Editions is a small-scale arts publisher, based in London, making prints, comics and zines, to sell online and at publishing fairs. 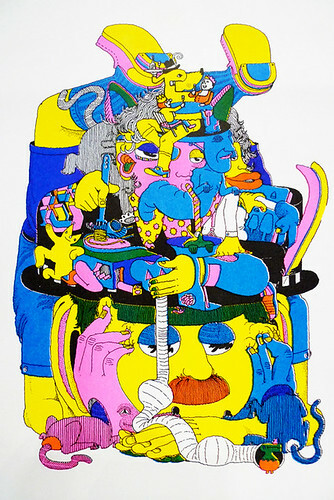 Sister company, Manymono, offers a print service, also using the Risograph machine. Founder Hugh Frost bought the gadget, which looks like a hefty-sized photocopier, on eBay. Frost explains why; ‘I had used an online “PDF to physical print” service but was disappointed by the quality of the end product, so I turned to Risography as a way to take control of the publishing process’. 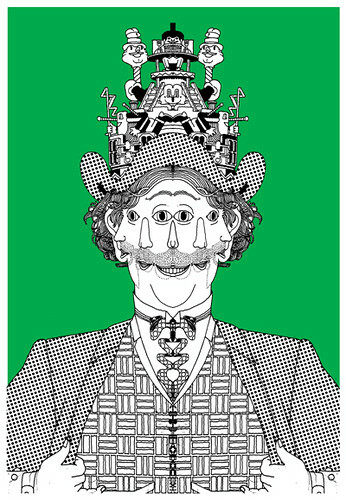 Above: Scott Barry, from Fundraiser Print Series no. 1. 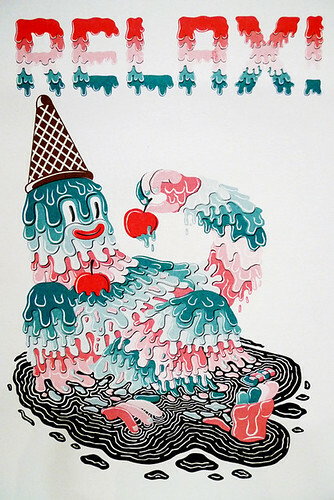 Most commonly used for single-colour, low-cost, high-volume print jobs, such as fliers and hand-bills, the Risograph is bit of a hybrid, a mechanised silkscreen process combined with spot colour off-set; unlike a photocopier, it uses ‘real’ ink and therefore doesn’t utilize heat to ‘fix’ the image. Confused? Here’s the technical stuff; a thermal imaging head burns holes in a thin plastic ‘master’, which then wraps around a colour drum. Paper passes beneath at high speed, ink is pushed through the master onto the paper. You can refill the drums with ink tubes; or switch colour drums to add a different colour, simply by passing the paper through the machine again. 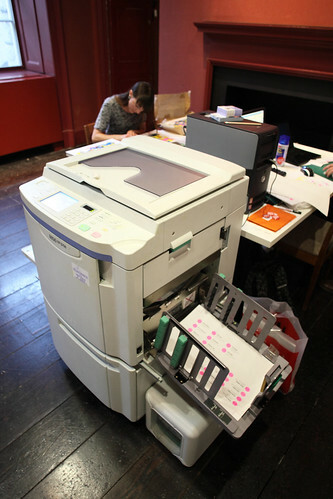 Below: The Risograph, just installed in Landfill Editions’ temporary studio at Somerset House. The whole process is automatic, produces thousands of prints an hour, either from an original placed on the glass top (just like a photocopier), or from a digital file. It’s not designed for intricate, multicoloured work though, as ink may build up on the rollers and smudge; so, rather than presenting a perfect reproduction, the Risograph offers an aesthetic all its own. (Incidentally, Ditto Press also uses a Risograph, see Chloë King’s Eye blog ‘Ditto – hard copy’). 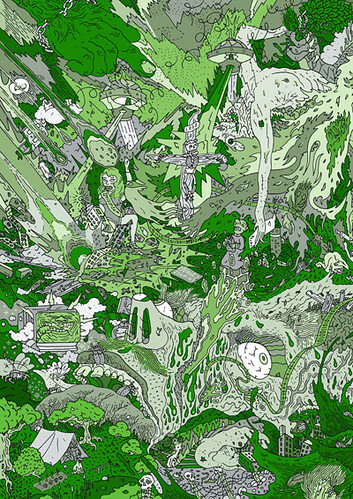 Above: Tommi Musturi, from Fundraiser Print Series no. 1. After buying the machine, though, Hugh discovered that getting hold of the full range of colour drums wasn’t going to be easy, as ‘they’re passed around a hidden network of printers’. So, Landfill Editions launched using just one colour drum, offering up green ink, and quite a vivid pea green at that. Above: Jim Stoten, from Fundraiser Print Series no. 1. ‘We released our first series of prints by ten artists to raise money for more colour drums; Riso’s standard UK eighteen-colour palette includes flat gold and fluorescent pink,’ explains Hugh. Stacked against the wall of the temporary studio are boxes containing pristine colour drums. ‘I’ve got a good range of colours now, but getting the rest has become pretty much an obsession,’ he adds. 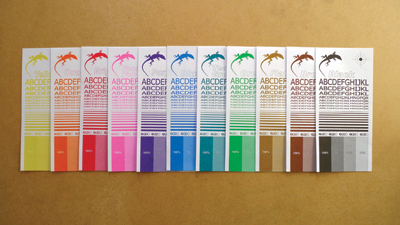 Below: A selection of the instructional colour charts, from the UK colour selection for the Risograph. 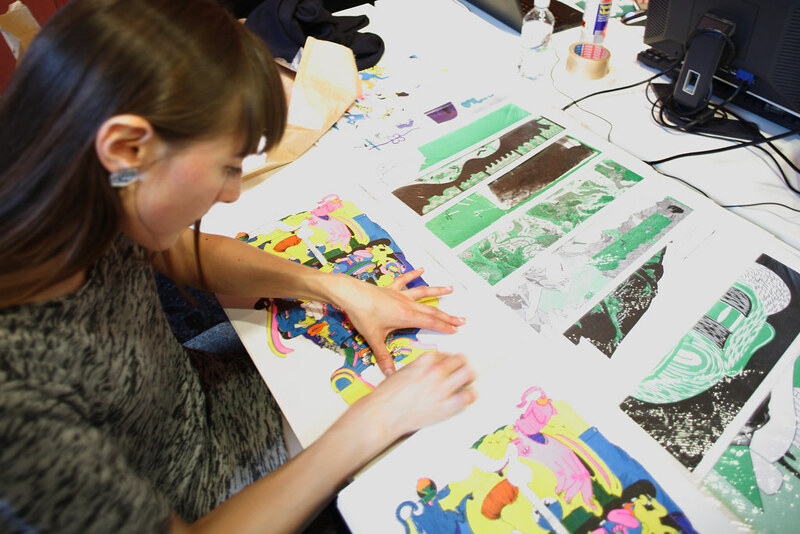 Above: Mike Perry contributes his exuberant mark-making to the new print series, launched at Somerset House. 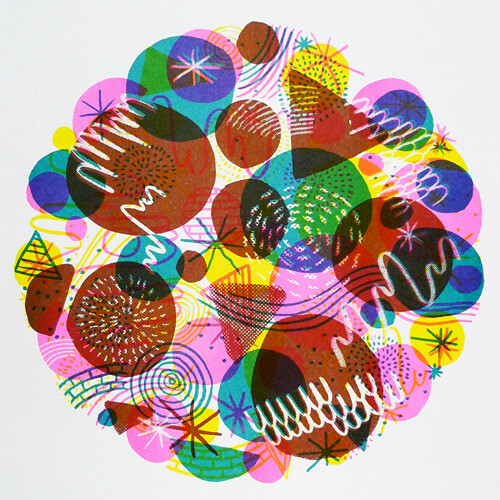 Above: Adrian Fleet’s new print is on show at ‘Pick Me Up’. Debuting at ‘Pick Me Up’ are ten new prints, comics and zines; plus, each day, invited artists will print pages for another zine, to be bound and available on the last weekend of the show, coinciding with a Publish and be Damned pop-up fair (2 > 3 May). 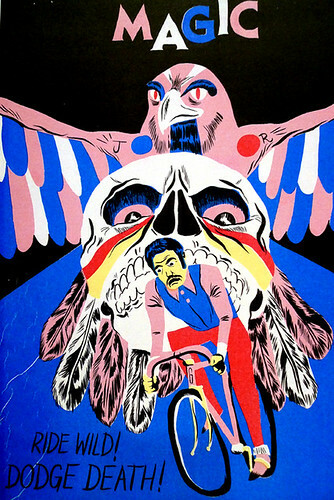 Above: Stevie Gee’s print for Landfill Editions’ latest series. Above: Jim Stoten’s second print for Landfill Editions demonstrates the Risograph’s multi-coloured possibilities. Making stuff to sell is part of the plan, and one of the motivations behind Hugh’s project. Making personal projects available at affordable prices is how many designers and illustrators are going beyond the usual commission-based work practices to engage directly with an audience. Taking back the means of production from high-tech professional printers or on-line ‘pdf to print services’, which are expensive, complex and impersonal, allows direct, hands-on experimentation. Messing around with a Risograph is one way to do that, without sacrificing the advantages of scale.